Read the News. Play the Game. Learn Something New. 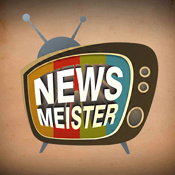 NEWSMEISTER: Daily News Trivia Quiz tests your knowledge of current events that truly are...current. The content of NEWSMEISTER trivia is refreshed daily so each game poses 16 questions and answers which reflect the present state of the world around you. You won’t encounter old, recycled questions while using this app. Please Note: The question format is now 16 questions. NEWSMEISTER isn’t trying to stump you with esoteric trivia; the game is designed for people like you. People who are interested in current events. People who engage in the latest social and political discourse. People whose awareness extends beyond their immediate world. You don't need a Ph.D from Harvard or MIT. Just follow the news! NEWSMEISTER is a quick game. At roughly three minutes long, it’s a great way to occupy yourself during a quick bus or subway ride, or while taking a coffee break. We like to think of NEWSMEISTER as short, but substantial news trivia. Take advantage of NEWSMEISTER’s in-game chat while competing against your friends. Our chat interface is easy-to-use and non-obtrusive so don’t worry: chatting and playfully heckling your opponent won’t disrupt the game. Trivia games are not hard to find in the App Store – no matter what you’re interests are, you’re bound to find a trivia game that suits your unique personality. Trivia apps are the perfect way to entertain yourself or play with others, and pick up some fascinating facts. These are the best and top-rated!